Vera Nathans was born in Amsterdam, Netherlands, on August 1, 1943. To protect her from the Nazis, her parents, Ans and Hemmy Nathans, placed her in hiding with two nurses from a children's hospital in Haarlem, Netherlands, before they were deported to Bergen-Belsen. Nathans was hidden with two other children, including a boy nearly the same age named Nico Visjager. One of the hospital’s nurses, Corrie Blauuw, claimed that Vera and Nico were her illegitimate twins. 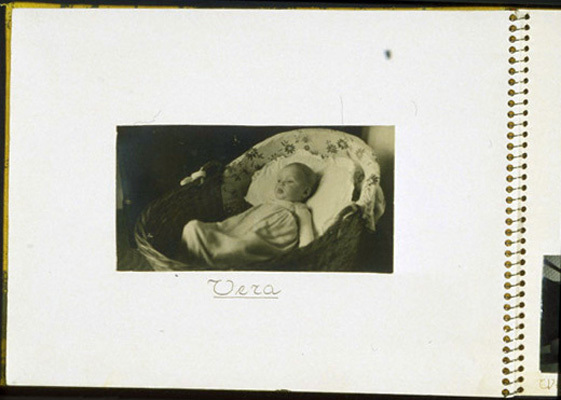 Vera's parents survived Bergen-Belsen and she rejoined them in Beverwijk, Netherlands. Vera married Sandy Semel in 1965 in Bussum, Netherlands. The couple relocated to Scarsdale, New York, and had three children, Susan, David, and Adam. Handmade photo album that Corrie Blaauw made. Corrie and Coka were the two women that hid Vera, along with Nico Visjager and a seven year old boy, Ronald Abas. Coka was the director of a children's hospital, and Corrie was a nurse in the same hospital; both were registered nurses. They lived in Haarelem, Holland. Corrie told the Germans that Vera and Nico were illegitimate twins born to her.